During my holiday to Okinawa I hired three cars; one in Naha, one on Tokashiki Island, and one on Ishigaki Island. This is an account of how I hired the cars, and what it is like to drive in Japan. 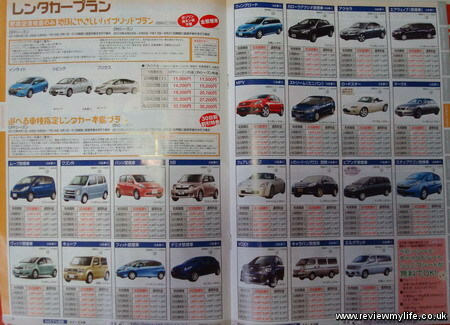 Two of the cars (for Naha and Ishigaki) were booked in advance at a Japanese travel agents in Takamatsu. The travel agency was called KNT and I went there because a Japanese friend told me they were cheap. If you want to book anything at a travel agent in Japan you will probably need to speak a reasonable amount of Japanese. There’s a lot of scope for things to go wrong if you aren’t fully understood, or if they don’t fully understand you. If you don’t speak Japanese you might be best off with trying to hire via one of the major car rental companies directly as they may have more English help available. I wanted the cheapest, smallest car available, each for 24 hours. I decided to hire the cars from Orix Rent-A-Car. I also wanted to have the cars delivered to myhotel and picked up from the hotel again. The lady in the travel agents was very nice and even phoned up both of my hotels to find out what parking facilities they had for collecting and leaving the car. One hotel had its own free car park. The other had a car park nearby which we’d have to pay to use overnight. I paid ¥7000 for each of the cars. I was told that in Naha the car would be brought to the hotel, but that at Ishigaki I’d be collected from the hotel by the car hire company. In Naha at the agreed time I went to the reception of my hotel. The man from the car hire company appeared, but instead of bringing the car to us, told us that he’d drive us to the car. Maybe we’d misunderstood something the travel agency lady had said. He drove me to the car hire company and in the office checked my international driving licences (this was before I got full Japanese driving licences), and alien registration cards. Even though the ¥7000 charge included some kind of insurance, I agreed to pay another ¥525 for some add-on insurance. Not entirely sure what it was for, and if I’d been in an English speaking country I might not have bothered, but here I thought it was best to get all the insurance I could get. He also gave me a brochure which had some reasonable road maps of Naha in it, and a ¥1000 petrol voucher which could be used at certain petrol stations. I was told I had to fill the tank just before I finished with the car (Japanese for full tank is ‘mantan’). This car needed ‘regular’ petrol. And I re-confirmed that I would be leaving it in the hotels car park overnight for them to collect in the morning. The car was an automatic and it took a little while to get used to. If you are used to a manual then the main difference is that you don’t need to worry about the clutch. There is still a gear selector, but all you have to do is move it from ‘park’ to ‘drive’ to get going. There was a third pedal in the car which was for the ‘hand brake’. If you try to drive with the hand brake on then the car starts beeping. The car had a GPS installed which was very useful as I drove to the North part of Naha to go to the Ocean Expo Park. There is an express way that connects the North and South parts of Naha. Usually you would have to pay to use it, but when I went they were allowing it to be used for free. I still had to get a ticket though. 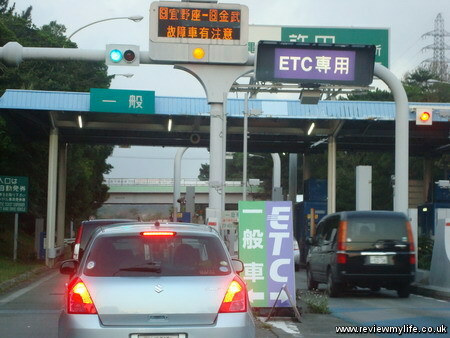 When you go to join an express way in Japan there are several different lanes you can use. There are ones that will allow you to collect a ticket, and there are ones for cars which have a smartcard payment box installed. These automatic lanes are labelled as ‘ETC’. Do not try to go through one of these lanes unless you have an ‘ETC’ card plugged into the ‘ETC’ unit in the car. The barriers will not open for you! If you are hiring a car you will probably have to go through the normal ticket barrier. The express way in Naha is modern and fast. There aren’t too many cars on it so you get a pleasant clear drive. At the express way exit (remember don’t use the ‘ETC’ exit unless you have the card) I had to give the ticket to a lady who was on the toll booth. Normally you’d have to pay depending on the distance traveled, but as they were letting everyone use the express way for free there was nothing to pay. You will probably have to visit a petrol station at some point. With most car rental companies it is a condition of hire that just before you return the car you have to fill the tank back up. Occasionally (as happened to me on the small island of Tokashiki) I was charged an amount for the mileage I drove instead. There are two main types of petrol station. Self service ones, and attendant operated ones. Before pulling in you should probably know where the petrol cap is and how to open it. The position of the handle isn’t always obvious. On one of my cars the handle could only be accessed by opening the driver’s door! If it is a self service place just make sure you fill up with the right kind of petrol. Most cars are filled with ‘regular’ (レギュラー) petrol. If it is an attendant operated place then you should ask for a ‘mantan’ (まんタン), which means a full tank. Keep your receipt. You might need to give it to the car rental company to prove that you filled it right up. There are three main types of car park system in Japan. The first type has car parking spaces with a ‘lock’ that rises between the front and back wheels after the car is parked. The ‘lock’ will rise a minute or two after you park the car to give you a small amount of time to make any adjustments to the car’s position. Usually each space is numbered and there is a main paying station for when you want to collect your car. Sometimes each space will have its own machine. When you want to collect your car you type in the number of your parking space and put in the required amount of money. The ‘lock’ will then lower and you can drive your car away. You may only have a limited time to do this so don’t wait too long! Do check the prices before parking – some can be very expensive. They often have different prices for peak and off-peak hours. The second type is the barrier car park where you collect a ticket on the way in. On the way out you put the ticket in a machine and it tells you how much to pay. When you pay the barrier will open. The third type is found in built up city areas where there is limited space. You will see tall windowless metal towers dotted about. There are the roulette car parks. You drive you car in through the door and when you leave the car will be rotated inside so that another space becomes free. To get the car back there may be an attendant, or there may be a fully automated paying machine. You will then need to reverse your car onto the circular turning table which will spin your car around so you can drive straight out onto the road. At the end of my Naha driving day I parked in the hotel car park. It was one of those car parking spaces where once you’ve parked the car a barrier rises between the front and back wheels. As I wasn’t going to be around when the rental company man collected the car I left the keys at the hotel reception, and I also paid the overnight parking charge in advance. All this had been pre-arranged with the car rental company. The next day when I came back from my day out the car was gone (collected – not stolen!). An account of driving around Ishigaki is on this separate post. 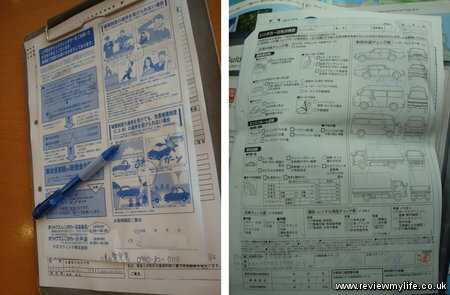 The account of my Tokashiki car rental experience is on this page. 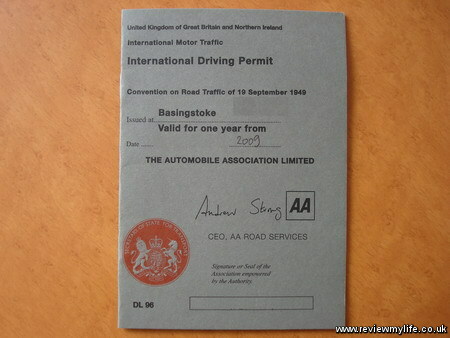 I have some information about getting a full Japanese driving licence here. This entry was posted on Friday, July 8th, 2011 at 9:34 am and is filed under Japan. You can follow any responses to this entry through the RSS 2.0 feed. You can leave a response, or trackback from your own site. Routette car parking sounds well exciting.